Roles are a group of permissions which provides you flexibility to assign various permissions to users across multiple projects. Test Collab administrators define roles — that is, all projects have the same project roles available to them. Every user can have different roles in different projects. For example- a user named Mike can have role and permissions of a tester in project A, but in project B he has a role of a manager. By default, Test Collab accounts have 3 pre-added roles but you can add as many roles you want. Click on Add link in sub-navigation. 5. Give a name to your role and check the permissions this role should have. All major sections have a permission to Manage that module or section. 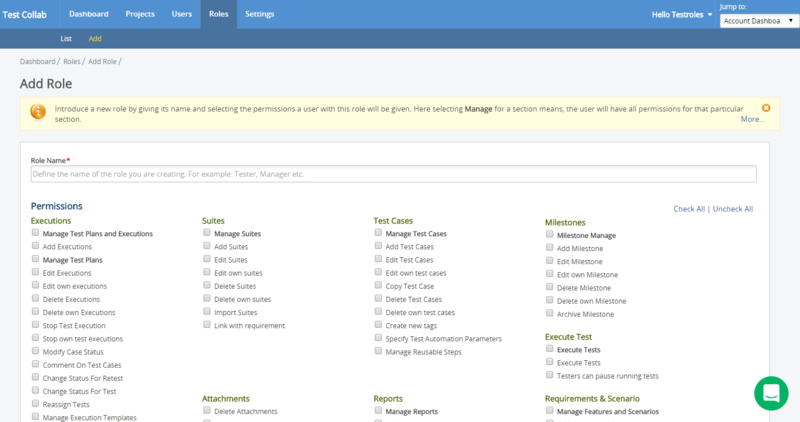 A check on "Manage" would mean that permissions have been granted for all actions under that module/section/entity. The administrator also has an option, to restrict a tester from pausing a running test, and if a user does not have this permission, then he will also not be able to switch to another test execution without finishing an already started test execution. Once you have created a role, you must assign them to users. Roles are project specific so every user can have different roles in different projects. For example- a user named Mike can have role and permissions of a tester in project A, but in project B he has a role of a manager. Select the project in which you would like to add team member. On project Dashboard, click on Settings and then on team members. Select one or multiple user(press shift key) and then select a role from dropdown below which should be assigned to these selected users.